Ann Hollyfield teaches at the Palo Alto Infant-Toddler Center in Palo Alto, California. The center is part of Palo Alto Community Child Care, a private, nonprofit organization that provides funds and subsidies to 15 child care programs throughout the city. In her role as head teacher, Ms. Hollyfield hopes to share her belief in the joy of caring interactions with infants and toddlers. Ms. Hollyfield has a degree in elementary education from the Oregon College of Education. 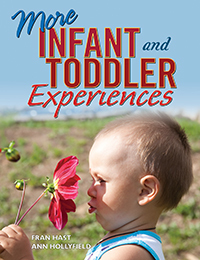 This sequel to the popular Infant and Toddler Experiences contains more than 100 engaging experiences for infants and toddlers that reflect and celebrate each child's development. Fran Hast and Ann Hollyfield base their suggestions on current research and more than 20 years of teaching infants and toddlers. What's the difference between a classroom activity and an experience? One you organize to pass the time, and the other you intend to last a lifetime. Help infants and toddlers figure out how the world works with meaningful experiences, organized by the three "Cs": curiosity, connection, and coordination. 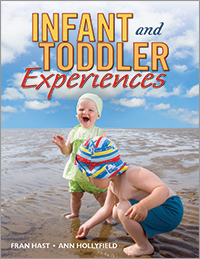 As the introduction says, "The special joy of caring for infants and toddlers is the chance to experience the world through their eyes."